How Losing 10 pounds in a month is simpler than you think. Let's get started on the 9 habits you can start today to lose 10 pounds in a month. To burn your fat , your cells need to be well hydrated. Dehydration can often be mistaken for hunger, and one way to avoid eating when you are actually not hungry is to drink water and stay hydrated. It can prevent catching every false hunger signal. So how much and how often should I drink? You've probably heard you need to drink 8 glasses of water, but the advice is outdated. The newest study found that the amount of water you need is determined based on your body weight. To calculate, multiply your weight in pounds by 0.5 and 0.7. The numbers generated are the range in ounces of water you should drink each day. For example, if you weigh 150 pounds, your numbers look like below. When you exercise in hot weather, your body’s need for water and electrolytes goes up. Make sure to drink extra water on your workout days. Also pass up the sugary sports drink such as Gatorade and Vitamin Water. Instead, go for 100% coconut water. If you get bored with drinking plain water, treat yourself to sparkling water with berries or a slice of lemon or lime. It's almost as tasty as soda drinks without the heavy load of sugar and calories. This is probably the most important thing you can do when you are trying to lose weight. By planning your week and day ahead, you can simplify your life and automate some healthy habits you want to put in place. For example, if you plan your grocery shopping before heading out, you are less likely to get tempted to buy things you shouldn't buy. Instead, you'd be much more focused during your shopping trip. It's simple, but a bit of planning can make all the difference. Better yet, plan your meals for the week ahead. Meal planning has gained so much popularity and is now proven effective especially for weight loss, as it makes sticking to eating healthy meals much easier. Whether you actually cook all your meals in advance or just have your weekly menu planned out, planning what you'll eat for breakfast, lunch and dinner can lessen your chance of going for a Chinese take-out dinner or sugary energy bar in the morning. If you don't have a shopping list or meal planner, grab Fitwirr's Weight Loss Planner. It helps you plan your meals by week and makes creating a shopping list a breeze. Grab one here. Did you know that Cameron Diaz blocks her Sundays for grocery shopping and meal prep? If she does that to stay healthy, lean and fit, so can you. Use your off day to get all your groceries for the week and do meal prep. Depending on your menu for that week, it can mean washing and cutting up all vegetables, cutting meat and fish into appropriate serving sizes, portioning out nuts and healthy snacks and packing them into single serving snack bags and/or slicing fruits to be used in infused water, flavoring tea, and homemade carbonated drinks! The goal here is to make healthy choices more accessible. A healthy diet is just another form of a proper, nutritionally balanced diet. A nutrition-based diet allows you to consume adequate carbohydrates, proteins, fast, vitamins and minerals to supply your body with energy for its basic functions (these are collectively called macronutrients). Your body is extremely sensitive to the foods you eat, and each time you eat, your chemical reactions and hormonal landscapes are affected. This is why most diets often fail; they ignore the work of hormones and solely focus on calorie counts. By focusing only on calorie intake instead of ingredients and foods you consume, you miss the macronutrients your body needs and put hormones out of balance, which slows down your weight and fat loss. This is why the foods you eat are just as important as the amount of calories itself. While calorie intake still plays a vital role in packing fat and losing it, healthy eating is about taking in micronutrients through foods. A good example of this is both a cookie and handful of almonds containing around 190 calories. Although they contain almost the same amount of calories, their nutrient contents are completely different. Almonds provide healthy, monounsaturated fats, minerals such as copper, magnesium, and phosphorus, and fiber, while the cookie provides sugar and empty calories to your body. Both of these foods, therefore, signal a different hormonal message. The almonds send a message of satisfaction and satiety, while sugar from the cookie causes insulin levels to spike and sends your body a message to store fat. The best way to ensure you are eating a healthy balanced meal is to ensure you have food from each of the following food groups: carbohydrates, protein, and fats. And when we say food, we mean food that's as close to its original form. Eating white bread, frozen chicken nuggets and vegetable oils don't quite cut it. Food such as vegetables, oats, brown rice, chicken, eggs and avocado should go on your plate! According to Dr. Jordan from Precision Nutrition, this alone is enough for many women to lose weight. Fats, also known as lipids, are essential parts of a healthy diet. Surprisingly, not all fats are bad like many fitness magazines and tabloids would like you to believe; you actually need all types of dietary fat: saturated, monounsaturated, and polyunsaturated fats, or essential fatty acids. Monounsaturated fats: Often dubbed the “good” fats, monos are important ammunition in weight loss, healthy cholesterol levels and hunger regulations. Monos are found in nuts, nut butters, avocados, olives and olive oils, and sesame. Polyunsaturated fats: Polyunsaturated fats are essential fatty acids found in fatty fish, as well as in some nuts, seeds and oils. The main of forms of these fats are the Omega-3s and the Omega-6s. Sound familiar now? Polyunsaturated fats are essential fats that your body needs in order to function properly and keep you alive. Adding healthy fats to your diet will help you slow down digestion, stabilize your blood sugar, and keep you satisfied longer between meals. Fats also help absorb vitamins A,D, and E, which are vital for your nervous system and health. 25 to 30 percent of your daily total calories should come from healthy fat. See the exact amount of fat you should eat based on body type click here to learn more. Takeaway: Not all fats are bad, eating healthy fat can actually help you lose weight, by keeping feeling full after eating. You’ll find them in olive oil, olives, almonds, cashews, peanuts, organic butter, avocado. Sugar spikes up a hormone called insulin and puts it out of balance. When insulin is flooded in your body due to starchy foods, your body stops functioning the way it should. Insulin then causes your body to store fat instead of burning it. Let's take a quick look at what happens after you eat and how your body respond. Carbohydrate-dense foods like white and whole wheat breads, pasta, rice, beans, candy and potato chips tend to dissolve quickly, and immediately free glucose into your bloodstream. This causes blood sugar to spike and alerts your pancreas to release more insulin, which acts as a transporter of glucose. In a healthy setting, insulin delivers glucose to muscle cells to be used as energy; however, when too much insulin is presented , your body becomes insulin-resistant and alerts your body to store it as fat rather than using it as energy. Foods that are low in starch and sugar prevent this insulin surge and help insulin function regularly. Takeaway: Eat fibrous, non-starchy vegetables and whole fruits for your carb intake. See the clean eating grocery list. Non-starchy food also prevents you from overeating by helping you feel full longer and keeping your insulin from spiking, and, as a result, store less fat and lose more weight. Fruits and vegetables, are very low in calories. you can eat as much as you want you’ll never gain any weight. Eat approximately 4 servings per day of each group. Calorie counting is not always necessary and required when losing weight and maintaining a healthy weight (see Habit #5 about eliminating nutritional deficiencies is enough to start losing weight); however, if you tend to eat carb heavy, fattening food such as pizza, creamy Fettuccine, fried dishes and French toasts, do it within your calorie allowance. We get it. Eating is emotional. Eating favorite dishes makes us super happy. On contrary, wiping out every single tasty dish off your menu for the sake of weight loss can feel like you are depleted on happiness. The matter of truth is either is good for you. Eating food you enjoy without a limit can expand your waistline, but also feeling stressed about what you cannot eat can increase your stress and make you one hot mess and lead you to a path of binge eating. That's where calorie counting can help. If your meal consists of oven-baked lean chicken breast, spinach salad and avocado, most likely you don't need to count calories. But if you know the slice of pizza you want to eat is 800 calories, you can prevent calorie overload by eating just half of it and have a salad bowl on the side to stay within your calorie allowance. It still can't beat eating a nutritionally well-constructed meal, but controlling your portion and calorie intake can lessen the harm and help you keep your joy. Also, if you are a diet beginner, keeping your calories in check should be part of your weight loss plan at least until you get a hang of eating balanced, nutritious meals that are within your daily calorie allowance. If you decide to use calorie counting as a weight loss method, here is how you calculate what your daily allowance is. For example, if you weigh 150 pounds, you should be eating anywhere from 1,500 - 1,650 calories a day to maintain your current weight. If your goal weight is 135 pounds, your daily allowance should be somewhere between 1,350 to 1,485. Please note that no matter what your goal weight is, you should never go under 1,200 calories a day. Also, if you need to lose more than 10-15 pounds, say 30 pounds. Break down your weight loss in 2 phases and aim for calorie allowance for 10-15 pound less in phase 1 and once you achieve it, go for additional 10-15 pounds less to achieve your ultimate goal weight. Exercise is another important component to weight loss. Engaging in regular exercise will increase the number of calories your burn and speed up your weight loss. Exercise burns calories by increasing your resting metabolic rate. It helps you lose fat by building lean muscle mass, which determines how fast and slow your body burns calories. Fat is relatively inert, but muscle is active and needs more energy to maintain itself. So the more lean muscle you have, the more energy calories your needs. Takeaway: More lean muscle mass means higher and faster metabolism. It also takes more energy to maintain the muscles and lead to more weight and fat loss. 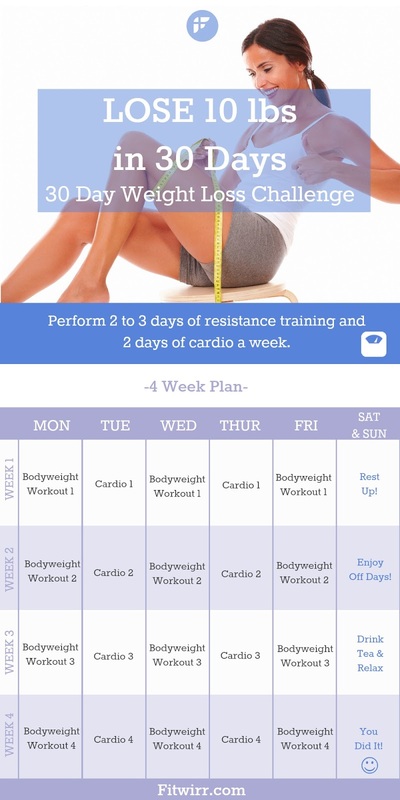 Do resistance training 2-3 times a week to build lean muscle mass to firm your muscles and do cardio 3 days a week to burn calories and strip fats off of you. Resistance training can be anything from bodyweight workouts to using resistance band or weights as resistance. For resistance training, start with beginners' bodyweight training level 1: This workout is designed for beginners with little to no experience. Click here to start. Perform 2 to 3 days of resistance training and 2 days of cardio a week. Tap into the power of food journal and record keeping. Document every foods and drink that you consume everyday and then calculate the total amount of calories. Write down the calories that present in each type of food you eat. Fitwirr’s weight loss planner make it super easy to calculate and keep track of every foods you eat and calculate the total calories you eat at the end of the day.